They're named after Shaikh Safi al-Din, a holy man from a family of Kurdish origin (possibly) which had lived in Azerbaijan for some generations. He became leader of a Sunni Sufi organisation (tariqa, brotherhood), which became established in Ardabil - where a shrine was erected to him after his death in 1334. He'd been influential among the newly Islamised Ilkhans, and was regarded as a godlike miracle-worker by the semi-nomadic Türkmen (Qizilbash) who flocked to the shrine, and attached themselves to the order. He was definitely not a Shi'i, though, to the embarrassment of later Safavids. Safi's tariqa grew in influence, and wealth - and was supported by the Qara-Qoyunlu. The leadership was passed down in the Safavid family. On the death of Ibrahim, the fourth Safavid shaikh, in 1447, a dispute arose between Ja'far his brother, the new head of the order, and Ibramim's son Junaid. Junaid was expelled, and travelled in eastern Anatolia and Syria, where he built up his militant and extremist following among the Türkmen (who were beginning to find Ottoman rule, and taxes irksome), with a recognisably Shi'i flavour - though orthodox Shi'i would have been horrified by his pretensions to divinity (Ali himself was also elevated to divine status by Junaid). His followers openly called Shaikh Junaid God, and his son [Haidar], son of God. They praised him thus: "He is the Living One, there is no God but he." Junaid looked for support from the Aq-Qoyunlu - which he, surprisingly, received: even marrying the sister of Uzun Hasan. As an Islamic militant, he set out to wage jihad against the Christian communities in Georgia - to do this he had to cross Shirvan: its ruler objected and he was killed. His son Haidar was brought up by Uzan Hasan, eventually marrying his daughter Halima. 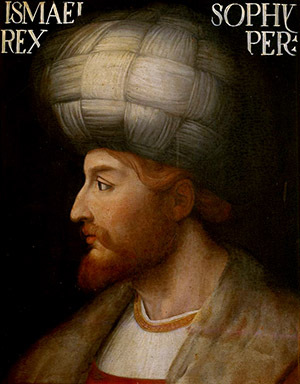 Haidar adopted the taj, a red turban which was the symbolic headgear for his Türkmen followers, known as the Qizilbash ("Red-heads" or "Redcaps"). But Haidar was killed like his father in Shirvan, on a similar anti-Christian mission -establishing them both as martyred saints in the eyes of their followers. He was betrayed by his cousin Yacub, (who had succeeded Uzun Hasan in 1478) who doubtless saw Haidar's ambitions -and the Qizilbash - as a threat to himself, and wanted to suppress them. Haidar's sons were imprisoned by the Aq-Qoyunlu. When Ali Sultan (nominally head of the Order) was killed by them in 1494, the younger son Ismail escaped. He was only seven, but was now head of the Safiyya community. He fled to Gilan (on the southwestern shore of the Caspian) where he was educated by a Shi'i (of sorts) tutor - like his grandfather Junaid, he nurtured delusions of divine status. In 1499, the 12-year old God-King set out with his Qizilbash army. He destroyed the Shah of Shirvan (avenging his father and grandfather) and eventually, taking advantage of their disarray of since Yacub's death in 1490, defeated the Aq-Qoyunlu and entered Tabriz (1501). Immediately Ismail proclaimed that his domains were to follow the Twelver Shi'i faith. Some communities were delighted, some horrified: most accepted it without fuss. Where there was open opposition, it was brutally crushed - with even scholars and poets being executed (as in Baghdad and Herat). Pockets of Sunnism, though, undoubtedly lingered on for many years. A forged genealogy traced Ismail's ancestry to the 7th Imam (Musa), and it was widely believed that the 4th Imam, Zain, was the son of the martyred Husain by the daughter of Yazdegird III, the last Sasanian king. Hence the royal Iranian blood flowed through the veins of the Arab Imams! Ismail undoubtedly had a personal religious commitment to Shi'ism - but it also chimed with long-standing Iranian rebellious sentiment, and with the traditional Sufi-influenced beliefs of his Qizilbash supporters. And, importantly, it enabled him to appear as a convincing opponent of the orthodox Sunni Ottomans . Ismail only controlled Azerbaijan. He needed to consolidate: by 1508 he'd recovered most of Uzun Hasan's territory in the west. He took western Persia from the last Aq-Qoyunlu in 1503; he retook the old Aq-Qoyunlu heartlands of eastern Anatolia in 1507 - though sensibly not (yet) confronting the Ottomans; and captured Baghdad in 1508. 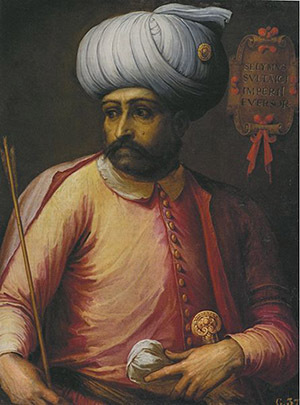 His Qizilbash devotees saw his apparent invincibility as evidence of his divine nature - though Ismail saw himself as primarily the inheritor of his Aq-Qoyunlu grandfather's rule, and perhaps too avenger, of his martyred father and grandfather, and of his Greek ancestors' fate at Ottoman hands. By 1509 the entire former Timurid empire (Transoxiana, Khwarazm, Khorasan, Afghanistan and eastern Iran) had succumbed to a new power from the north, the Uzbeks (Özbegs), under their own apparently invincible ruler, Muhammad Shaybani. Ismail had coexisted with the later Timurids. Their successors, though, needed to be dealt with. Ismail marched east and defeated and killed Muhammad Shaybani near Merv in 1510. He's said to have had his skull silvered and made into a drinking cup. He set the Oxus as his new frontier - allowing Ubaid Allah, Muhammad's nephew to retain control in Transoxiana (where Uzbek power was to remain: hence modern Uzbekistan). The Uzbek threat had not gone away. But Shah Ismail and his Qizilbash had reunited the two halves of Iranshahr. According to their traditions, the Ottomans derived from a chieftain who, around 1230, under Mongol pressure, led his tribe from Turkmenistan to settle, eventually, in Bithynia (northwest Anatolia, close to the remains of the Byzantine empire). Their background was very similar to the Aq-Qoyunlu and Qara-Qoyunlu of central and eastern Anatolia. They became known as Osmanli, or Ottomans after Osman (Uthman) the grandson of the founder. They began to expand by exploiting Byzantine weakness in Anatolia and Europe. They experienced a setback in Anatolia (though not Europe) 1402 when Timur routed Bayezid I, but soon recovered, thanks to the peace-oriented policies of the Timurid Shah Rukh. After many attempts in the previous two centuries, the young Ottoman sultan Mehmed II took Constantinople in 1453. His descendant, Selim I ("The Grim", ruled 1512 - 1520) was looking at two threats to his power: the Mamluk empire (which had ruled Egypt and Syria since 1250) - and the newly-resurgent power of Iran, united again under Ismail, with its traditional links to and influence over the Turkish tribes of eastern Anatolia. The Ottomans had been long been nervous about the loyalty of their eastern Anatolian subjects - many of who were being lured westward through dislike of Ottoman rule, and the lure of the Safavviya's religious ideas, and the expectation of plunder. There had been deportations (to Greece) of Qizilbash who showed Safavid sympathies, and the eastern frontier was patrolled to prevent them crossing the border. In 1507 Ismail had appeared to threaten the Ottoman province of Rum - though he then in fact turned east to confront the Uzbeks. But in 1511 occurred a major uprising among the disgruntled Qizilbash in the Antalya region - there were massacres, villages razed, mosques destroyed. Ottoman attempts to suppress the rebellion, which was only partially successful. Many Qizilbash crossed into Iran and joined Ismail - who now encouraged a larger insurgency throughout Rum. The Ottomans struggled to keep control - and atrocities continued. In 1512, the sultan abdicated in favour of his son, Selim I "The Grim" (1470-1520) who hated Ismail. He realised the fanatical Shi'i-sympathising supporters of the God-King had to be stopped, or the continuing rule of the Ottomans in Asia was in danger. News reached Selim that Ismail's army had invaded Ottoman territory to support the Qizilbash revolt. It was being helped by his brother Murad, and had already defeated an Ottoman force. Selim acted with ruthless speed. All known Qizilbash were rounded up and imprisoned or massacred (40,000).. In 1514 he attacked Iran. He justified war against fellow-Muslims by declaring the Shi'i as heretics. Ismail had never lost a battle - and seems to have approached confrontation with Selim as if invincibility were guaranteed. It wasn't. On 23 August 1514 at the Battle of Chaldiran he was utterly defeated by the larger and better-armed Ottoman force, who had both artillery and firearms, which the Iranians lacked. But Selim's army was not keen to remain in Tabriz, and was not equipped to pursue Ismail eastwards. Within a week of his great victory, Selim headed back west, leaving Ismail free to return to his capital. But the Safavids lost their Anatolian provinces - having to accept the Iran-Turkish frontier which has persisted to this day. All Anatolia would henceforth be Ottoman territory. Ismail had lost his aura of invincibility - and his confidence. He never led an army again - retiring to enjoy hunting, sports and drinking. He died in 1224 after a hunting trip to Georgia. Selim went on to attack the Mamluks (accused of sympathising with heretical Shi'i Safavids) and conquered their entire realm (1216-1217). This included Mecca and Medina, allowing the Ottomans to claim total supremacy over the Sunni world. I am the Alexander of the people of this age. Ismail's conquest of Iranshahr - including Khorasan and Afghanistan - was achieved with a Turkish army. The Türkmen tribes who had helped him to victory - and paradoxically because of their defeat to the Ottomans at Chaldiran in 1514 - saw themselves as the mainstay of the Safavid regime. But Ismail, whose own inheritance was partly Türkmen, but who was also part of the Iranian elite sought to balance the Türkmen influence. Traditionally the top administrative posts - even under the Timurids - had gone to Iranians: the same family - sometimes the same man - served generations of rulers. Ismail continued this practice, but began allowing Iranians to fill military positions as well. Gradually the Safavid empire was evolving into a specifically Iranian empire, though tensions remained, and occasionally erupted between the nomadic Turkmen and the urban Iranian populations. But Ismail's domain remained a ruthless monarchy, made more absolute by the acceptance of the divine nature of the ruler. He continued to speak Turkish, and wrote poems in Turkish. There were may other Sufi brotherhoods active at this time - around the Islamic millennium -in Iranshahr, with various Mahdis (Messiahs) claiming descent from Ali, and foretelling the apocalypse, and each forming a focus in their localities for religious, social, economic and political life. The Safiyya inspired by Safi al-Din were more successful than others because of the enthusiasm over several generations of their Türkmen devotees, the Qizilbash - who were prepared to fight and die for Ali and Islam. Occupied much of modern Azerbaijan (Baku). It had been ruled by the same Arab dynasty since the conquest - they had however adopted an Iranian identity - with the Shirvanshahs giving themselves names from the Shahnameh. Having succumbed earlier to the Mongols, they cherished their independent status. Later, because of its twelve folds, the taj was seen as a Shi'i marker, the 12 folds standing for the 12 Imams. But there's as yet no evidence for traditional Shi'ism among the Safavid movement. Stories were told that the Qizilbash threw themselves unarmed into battle, believing in Ismail's miraculous powers. "The ghazi (heroic warriors) have come forth with crowns of happiness on their heads. The Mahdi's era has begun. The light of eternal light has dawned upon the world." Origins uncertain - they traced their ancestry to Shiban (Arabized to Shayban), brother of Batu, founder of the Golden Horde. The Uzbeks were kin to the Kazakhs ("Cossacks") who inherited their control of the Steppes once the Uzbeks moved south intoTimurid lands. The Uzbeks had been harassing the Timurids since the 1430s, but without permanent success until the rule of Muhammad Shaybani in around 1460. This had been in Timurid control - the last of his family to attempt to rule there, Babur, was ousted by Ubaid Allah - but moved into India, where he founded the Moghul dynasty. Was by now in terminal decline. Byzantium had been occupied by "Latins" (ie Crusaders) since 1204, and had only just (1261) got rid of them. In Iranian Azerbaijan, in the extreme north-west of modern Iran. 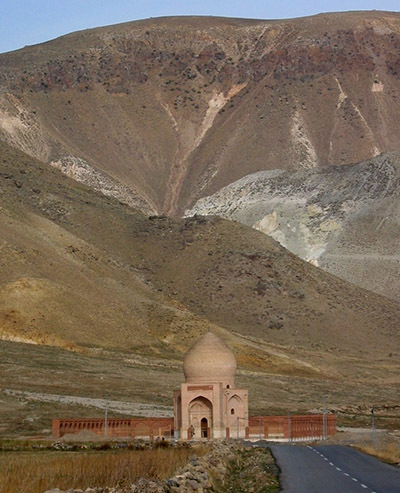 Iranians were called "Tajiks" by the Turks - a disparaging term.